I have just returned from Israel, where I spent an exhilarating week with my family. During our short visit we visited many places and met a range of wonderful people. I never fail to be amazed at the vitality of this extraordinary country; how is it possible that such a physically small space can be home to so many different types of people and experiences? Although, for those of us who see the modern State of Israel as a prelude to the Messianic era, the fact that all these disparate parts can hold together to make a functional whole, and that it all somehow works, is just further proof that something higher is at play – a force that defies our comprehension, and that is greater than any and all attempts to define it and undermine it. Our last stop on the way to the airport just before leaving was a visit to the Israel Children’s Museum in Holon, where we took part in a tour called “Dialogue in the Dark”. Billed as a “fascinating social, moral and emotional journey,” it was a formative experience for all us, instructive in ways we never imagined it would be. For about an hour we were led through a series of rooms in complete darkness by a guide named Sabir, who helped us navigate a variety of different settings from everyday life, including a supermarket and a public street. We stumbled around trying to get our bearings in surroundings that would have been very familiar had we been able to see. Initially our boys were boisterous and energetic, but as the hour unfolded, the sobering reality of sightlessness calmed them down. Finally, before exiting the darkness, we sat together with Sabir and shared our reactions with her, and with each other. Never again would we take sight for granted; we now had some understanding of what it means to be blind or visually impaired; how sad it must be for those who cannot appreciate the kaleidoscope of colors and contrasts the world around us has to offer. These were just some of the thoughtful reactions of Eli, 19, Meir, 16, and Uri, 12, who for the first time in their lives were compelled to consider the world from the perspective of someone with a debilitating handicap. And these messages were hammered home when we finally saw Sabir for the first time, as we emerged, squinting, into the light. For as it turned out, Sabir is severely visually impaired. We continued discussing our experience as we drove to the airport. One of the things we had done in the museum was try and identify different everyday objects and fixtures just by touching them. We had found a car and a mailbox in the street, and fruits and vegetables in the supermarket, but we had not been able to see them. What color were they? We simply could not say. We realized that seeing something takes our consciousness of it to a whole new level. Sabir had also told us how it was impossible to describe a color or distance to someone born blind, as neither of these can ever be adequately explained to someone who has never physically seen them. In Parshat Yitro, the Torah describes the Sinai revelation experience using the curious expression: רֹאִים אֶת הַקּוֹלֹת – the Jewish nation “saw the almighty sounds” (Ex. 20:15). Rashi explains this to mean that “they saw that which should be heard, something impossible… on any other occasion.” This phenomenon was a miracle unique to Sinai. But why was it not enough to hear the sound of God’s voice? Why did it need to be seen? 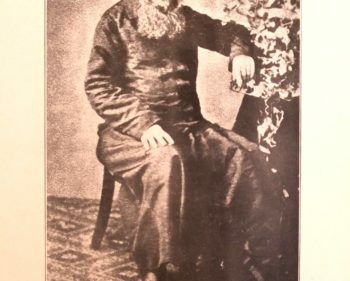 Rabbi Chaim of Volozhin was once extolling the virtues of his son Rabbi Isaac to his students, suggesting he would have been considered a great Torah scholar even in the era of Talmudic sages. His audience was shocked by this hyperbole, particularly because they knew R. Chaim was not prone to empty praise. If this was how he described his son, they asked, how would he portray his revered teacher, Rabbi Elijah, the Gaon of Vilna, whom he considered the epitome of rabbinic scholarship? R. Chaim dismissed his students’ astonishment, and suggested that the difference between R. Isaac and the Vilna Gaon was simple. If one was to ask someone to verbalize in reverse order any text or number sequence with which they are very familiar, they would certainly be able to do it, but only once they had first been through the text in their minds in the correct order. R. Isaac had the ability to do this with the entire text of Torah and Talmud, said R. Chaim. But the Gaon of Vilna’s ability transcended this superlative gift; he could cite the previous word without having to run through the text from the beginning. When someone is asked to recite a familiar text by-heart in reverse order, they rely on something called auditory memory, which means they must first go through the text in their minds in the correct order. But if they have the text open in front of them, all they need to do is look at it and read it backwards, hardly a significant feat. For the Vilna Gaon, said R. Chaim, every word of the Torah was virtually visible before of him at all times. It was this that put him head-and-shoulders above Rabbi Isaac. The revelation at Mount Sinai was not an auditory memory experience; every aspect of it was a vision, seen by those who were present. Even God’s voice was experienced as if it was seen and not just heard. Mishpatim begins with the laws of ‘Eved Ivri’ – an indentured Jewish servant. If after six years he wishes to remain a servant, the Torah instructs for him to be brought to the rabbinical court where his ear is pierced. Rashi explains that the ear is singled out, as it is “the ear which heard at Sinai that the Children of Israel are My servants and not servants to a servant”. By choosing to remain indentured the servant has demonstrated that for him the Torah is merely an auditory memory, not a vivid vision seen in all its glorious color and texture. And just as colors and distance cannot be explained to those who were born blind, the dynamism of a Torah life can never be truly appreciated by those who have never seen its beauty.